One complication of thalassemia is thromboembolism (TE), which is caused by an abnormal red blood cell surface, as well as endothelial and platelet activation. These findings are commonly observed in severe β-thalassemia. However, limited information on α-thalassemia exists. This study enrolled subjects with deletional and non-deletional α-thalassemia and normal controls (NC). Plasma and serum of subjects were tested for endothelial activation markers including thrombomodulin (TM), vascular cell adhesion molecule-1 (VCAM-1), and von Willebrand factor antigen as well as platelet activation markers including thromboxane B2 and platelet factor 4. A total of 179 subjects were enrolled: 29 in the deletional group (mean age 13.3 ± 4.4 years), 31 in the non-deletional group (mean age 12.9 ± 4.8 years), and 119 in the NC group (mean age 13.6 ± 3.0 years). Twenty nine percent of subjects in the non-deletional group received regular red blood cell transfusion and iron chelator administration. Serum ferritin level was higher in the non-deletional group than that in the deletional group. 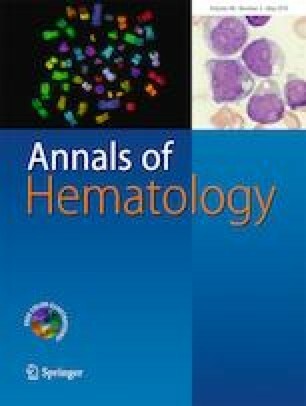 Multivariate analysis demonstrated that VCAM-1 and TM levels were increased significantly in α-thalassemia compared with NC group (816.8 ± 131.0 vs 593.9 ± 49.0 ng/ml, and 4.9 ± 0.7 vs 4.0 ± 0.4 ng/ml, P < 0.001 respectively). VCAM-1 and TM levels in the non-deletional group were significantly higher than that in the deletional group. The present study demonstrated endothelial activation in children with α-thalassemia disease, especially those in the non-deletional group, which might be one risk factor for TE in α-thalassemia disease. NC designed the study and reviewed the manuscript. PS performed the study and wrote the manuscript. AC, DS, and PW involved in the care of patients. PK performed the laboratory. This work was supported by a Grant from the Faculty of Medicine Ramathibodi Hospital, Mahidol University, Bangkok, Thailand. We thank Edanz Group (www.edanzediting.com/ac) for editing a draft of this manuscript. Ethical approval for the study protocol was obtained from the Ethical Clearance Committee on Human Rights Related to Research to Research Involving Human Subjects, Faculty of Medicine Ramathibodi Hospital, Mahidol University, Thailand (ID 12-59-09).